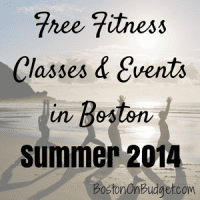 There are so many free fitness classes and events in and around Boston available this summer. No excuses now, right? Let me know in the comments below which free fitness activity is your favorite! Boston Parks Summer Fitness Series: Free bootcamp, yoga, zumba, salsa dancing and much more at local Boston parks in June, July, and August starting June 2, 2014. For the full schedule, please head here. Norman B. Leventhal Park: Free Yoga, Pilates, Bootcamp, and Zumba classes offered almost every weekday at Post Office Square in June, July, and August starting on Monday, June 2, 2014. For the full schedule, please click here. Summer Yoga at Frog Pond: Starting on Thursday, June 6th, free yoga classes will occur on the lawn adjacent to the Frog Pond Carousel at 6:00pm every Thursday night this summer. Please bring your own mat and blocks if you can. Bootcamp on the Greenway: Get fit with free Bootcamp from 6-7pm at the North End Greenway on Wednesday, June 4 & June 18th. MSL Cardio Pilates Summer Bootcamp at Rose Kennedy Greenway: Free MSL Cardio Pilates Summer Bootcamp twice a month on Monday nights from 6:30pm-7:15pm on the Rose F. Kennedy Greenway from June to September. Free Salsa in the Park: Starting at 6pm on Monday, June 9, 2014 enjoy free salsa dancing this summer at the Blackstone Community Center park in the South End. Yoga on the Green: Free Yoga on Sundays from 10am to 11am @ The Street in Chestnut Hill this summer. Island Yoga at Spectacle Island: Enjoy a gentle yoga class on Saturdays starting on June 21, 2014 through August 30, 2013 from 10am to 11:30am. Classes are free (just bring a mat or towel) but you do need to pay for ferry fares to get to Spectacle Island. Free Fitness at Fort Point: Various free fitness programs will be offered around the Fort Point Channel starting on June 23rd, 2013 at 5:30pm. Classes and dates vary throughout the summer. Free ReWire Tuesdays: Free fitness classes in the North End every Tuesday night in July from 6:30-7:45pm. Tai Chi: Thursdays at 9:30am at Fielder Field. Sponsored by The Boston Kung Fu Tai Chi Institute. Dancing in the Park: Thursdays at 6pm at the Hatch Shell. Sponsored by Arthur Murray Dancer Center. Hatha Yoga at Intercontinental Hotel: Free one hour yoga class on Saturdays at 9:30am at Intercontinental Hotel’s waterfront lawn. Nike Boston Run Club: Free Run Club on Tuesdays and Thursdays at 6:30pm and Saturdays at 9am. Porter Square Run Club: City Sports sponsors a run club for 3 and 5 mile loops every Saturday at 10am, which meets at Porter Square. Wednesday Run Group: Marathon Sports sponsors a run group every Wednesday night at 6:30pm which meets at their Boston, Brookline, and Wellesley store locations. lululemon athletica Run Club: Every Monday run 3-8 miles along the Charles River. Meet at the lululemon store at the Prudential Center at 6pm then after the run reward yourself at the Back Bay Social Club for free apps, drinks, and good company. If you are looking for even more fitness this summer in organized calendar form, check out Little Miss Runshine’s Free Fitness Calendar or the Boston Moves Community Calendar. Also, as mentioned before on the blog, fitness is not my specialty. Please make sure you do your due-diligence and research these free programs before you head out. Some events are rain or shine, but some free classes are weather permitting and may be cancelled at the last minute. If you liked this post, please consider signing up for Boston on Budget’s free nightly e-mail or following me on Twitter or liking me on Facebook. Thanks! Lunachix running club. Every wednesday 6:30pm meet at athleta on newbury street for a 3 or 4 mile run with women. Run at your own pace. Free luna bars at the end of each run. Also there is free Bootcamps at Christopher Columbus Park Friday mornings ( June July and August) 6:30am-7:30am as part of the Boston Moves for Health Program and Beantown Bootcamp.